Choose your asparagus wisely; making sure that they are not wilted and the bottoms are not dried out. Once you get the asparagus home, wrap the tips in a loose paper towel (this keeps them from getting mushy) and then store (up to 5 days) in your vegetable crisper. These tips were largely empirical, as in they worked for me. But admittedly I was wrong, at least half wrong. 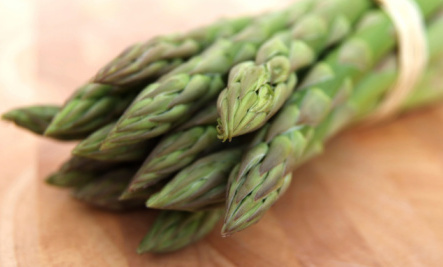 Select the freshest asparagus and then, once home, remove the rubber bands and cut off about an inch of the bottom stalk (much like what you would do for cut flowers) and then submerge bottoms upright in an inch or two of water in a glass. Cover with a loose fitting plastic bag and then store in the fridge. They should stay fresh for at least a few more days than they would have with my old method. But be warned: these little bouquets tend to be top heavy and can easily be knocked over in a crowded fridge. How do you keep asparagus fresh? Do you have another method that works better? Have you ever been wrong about your own kitchen wisdom? I just bought some fresh asparagus last night so this tip is very timely. I am going to go take care of them right now. Thanks for the helpful tip. You are right about the crowded fridge, but I'm going to try sticking them upright in water. Should have better results, after all that how I see them when I buy at the store. Thanks for the handy tip on one of my favorite vegetables. Is it true that asparagus makes your wee stink? Either that or my son is taking something he shouldn't be! He says it's the asparagus??? I have a jar which is used exclusively for storing asparagus in the fridge. I don't put a plastic bag over the top though.